Creating an interactive space in downtown Charlevoix improving walkability & adding to the vibrancy of town. 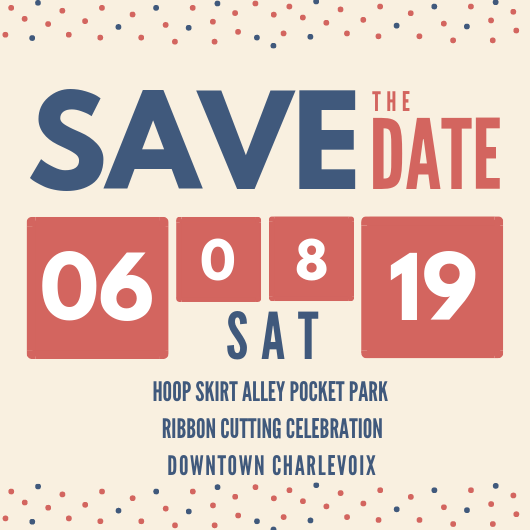 Hoop Skirt Alley will be a place to make memories! We at the Charlevoix Main Street DDA, along with our Junior Main Street Committee of Charlevoix High School Students, have been working to re-imagine one of downtown Charlevoix's favorite alleys! The result includes transforming Hoop Skirt Alley into a pedestrian plaza & outdoor gathering place complete with comfortable seating, decorative lighting, art, and plenty of fun. 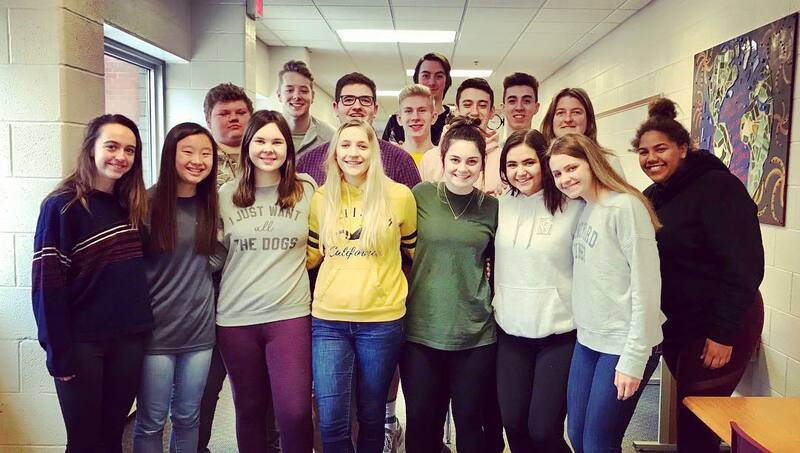 Meet the Charlevoix High School Junior Main Street Committee members! Imagine Hoop Skirt alley as a place you don't just want to walk through, but you are drawn to! To relax, to play, and be inspired. Imagine a space where residents and visitors come downtown just to see, sit, and stroll in a vibrant and cool alley environment in the 300 block of Bridge Street. Here you will enjoy art, outdoor seating with friends, twinkling lights, and games. This re-imagined space is based on recommendations made in the Charlevoix Downtown Alley Corridor Vision which was written by Michigan State University's School of Planning, Design, and Construction in January of 2018. The report factors in feedback gathered at several public meetings that took place in 2017. Charlevoix citizens had concerns mainly regarding underutilized and unmaintained alleys, and the challenges of safe and appealing pedestrian areas. You asked for more gathering spaces, family and kid friendly features, vibrant alleys, well-lit spaces, cultural and artistic elements, outdoor seating, and priority on pedestrians and bikes. This project has been taken on by high school students as part of the Junior Main Street initiative. In total, this project will cost $16,000. $4,000 of funding is coming from Charlevoix Main Street DDA. The project will be complete by June with a Ribbon Cutting Celebration on Saturday, June 8th complete with live music, food, and a hula hooping competition! The remainder needs to be raised by the community - this is where you come in! When you contribute to this project, you are helping our youth bring a public space to life, aiding in the overall vibrancy of our beautiful downtown. Our alleys are already hidden gems, but the re-imagined Hoop Skirt alley will offer residents and visitors a more connected, artistic, walkable and welcoming downtown space. Together with our community partners we will create a enchanting space for people to sit, shop, dine, and experience a hidden gem in our downtown. Your support enhances our mission to create a vibrant, strong, and economically viable downtown that serves as the heart and hub of our community! Unable to contribute financially? That's okay! Help us out by spreading the word to your friends, family, and colleagues, and then join us on June 8th to celebrate the completion of the project! Sharing this campaign on Social Media is a fantastic way to spread the word.